Linfield manager David Jeffrey insists he is not throwing in the towel despite slipping three points behind champions Cliftonville in the race for the Irish League championship. The Blues were held to a 1-1 draw by Portadown at Windsor Park on Saturday and there are now just two matches left. 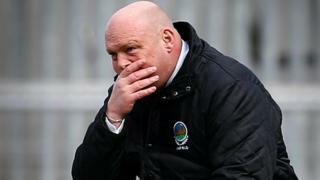 Long-serving boss Jeffrey is leaving Linfield at the end of the season, having guided the Belfast club to nine league titles.